Happy Monday you lovely things! How are you all today? I'm in such a chipper mood today after a lovely weekend and a diary full of exciting things for the week ahead - life is good at the moment. I got some super exciting post on Monday morning when our gorgeous personalised wedding cake topper arrived. I am totally in love with it and I can't wait to see how pretty it looks perched on top of the very delicious cake that my Dad is going to make us. Buying pretty wedding bits is fast becoming my new favourite hobby! On Tuesday evening we headed over to my friend Teddy's house to celebrate pancake day with our lovely friends. We devoured stacks of savoury and sweet pancakes with ALL the tasty toppings and drank prosecco while catching up on everything that's been going on in our lives - it was a fab way to spend a midweek evening. I was lucky enough to attend two amazing blogging events in the city centre this week. Both were new store openings and I came away armed with goodies! First of all I got to have a sneak peek of the new Homesense store which is located on the Headrow (FYI, it's incredible!) and then I headed down to check out the new Model's Own store in Trinity which is super cool. Keep your eyes peeled for a sneak peek at the bits and pieces I picked up from both as I'll be getting some posts written up soon. I'm a huge fan of Amy Poehler and I read her book a couple of years ago and loved it, but this week I've been listening to the audio book version in the car. Her wise words and hilarious anecdotes are even more amazing when read in her own voice and it has definitely made my commute way more fun. I've got a feeling that this may end up on my favourites list every week if I'm not careful, but I just cannot get enough of cuddles with our tiny little nephew! Both Sam and I are totally besotted and he really is the cutest thing ever - he has the funniest little expressions already. I'm so glad that we live so close by and I can't wait to watch him grow up. On Wednesday night I did something that was both seriously nerve wracking and super exciting - I chatted to Gemma Cairney live on Radio 1! I got a call from the producers on Monday to ask if I wanted to come on the show, and even though it scared the living daylights out of me, I knew I couldn't turn the opportunity down. I actually really enjoyed it - I'll never not be grateful for all the weird and wonderful experiences that this blog brings my way. Sam and I both took Friday off work and headed to Anglesey for a long weekend by the sea. The main reason for our trip was to do a site visit at our wedding venue and it was so exciting to see it all again! We also visited the church where we'll be saying "I do!" and now I really can't wait for our wedding day to roll around. I think there is some sort of unwritten rule in the UK that if you're near the seaside then you have to have fish and chips and we weren't about to go around breaking any rules this weekend! We demolished some salt and vinegar fried goodness for dinner on Friday and it was delicious. On Saturday my Mum and Dad and auntie and uncle came to meet us on the island for the day and we had such a lovely time showing them around the island. 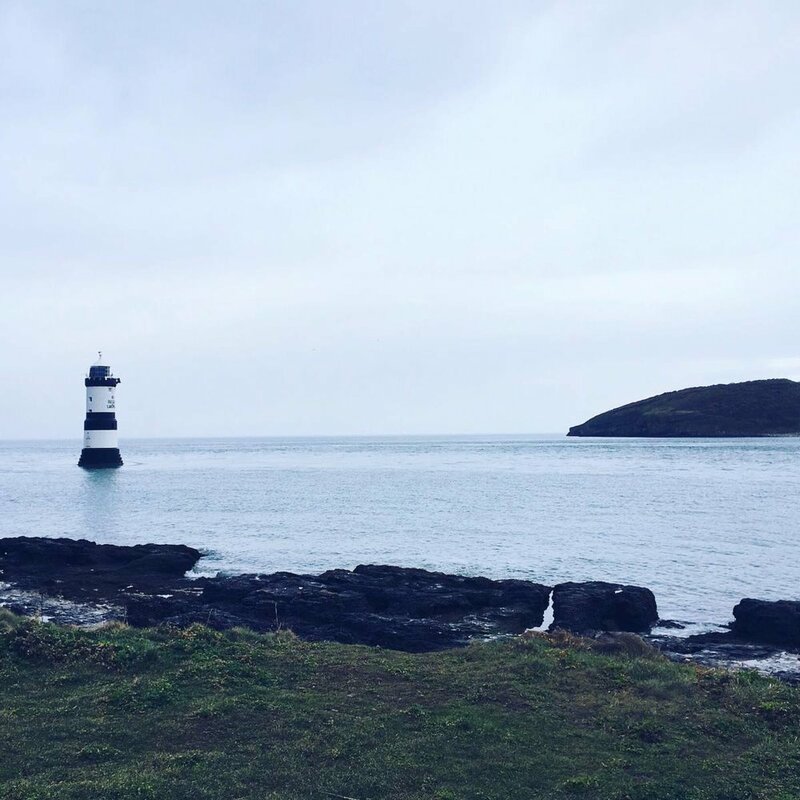 Anglesey is one of my favourite places in the whole world and it was so lovely to see how much they loved it too - I can't wait for the rest of our friends and family to see it in June! We managed to get loads of big wedding things ticked off this weekend - we met with the vicar, ordered our rings and finalised the menus with the caterers, plus we got started on a couple of wedding DIYs. I feel a little bit more relaxed about the whole process now we've got all the big stuff sorted and now I feel fully ready to enjoy the run up to the big day.